It's in a "pencil case", not a briefcase. You can compare the size to the plug on the right. 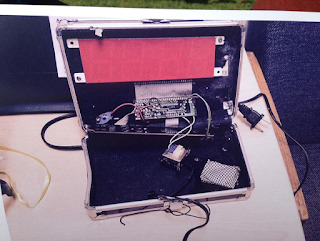 They didn't think it was a bomb, but a "hoax bomb". If they thought it might be a real bomb, they would've evacuated the school. Texas has specific laws making illegal to create a hoax bomb -- it is for breaking this "hoax bomb" law that the kid was arrested. This changes the tenor of the discussion. It wasn't that they were too stupid they thought it was a bomb, it was that they were too fascist believing it was intentionally a hoax. These questioned him, and arrested him because his answers were "passive aggressive". This is wrong on so many levels it's hard to know where to begin. 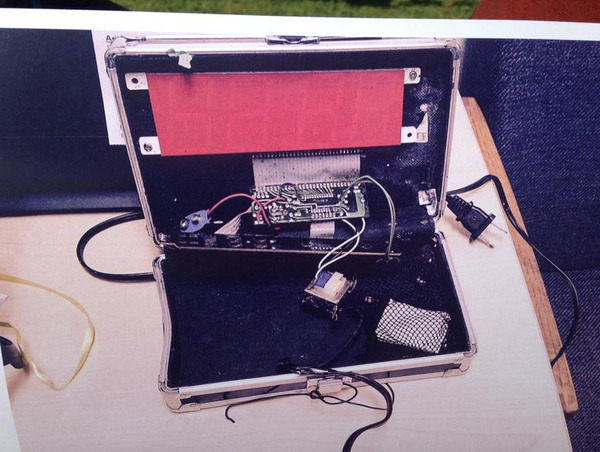 Of course, if the kid's innocent his answers are going to be passive aggressive, because it's just a clock!!! It was the english teacher who turn him in. Probably for using a preposition at the end of a sentence. The engineering teacher thought it was a good project. It's actually a sucky project. 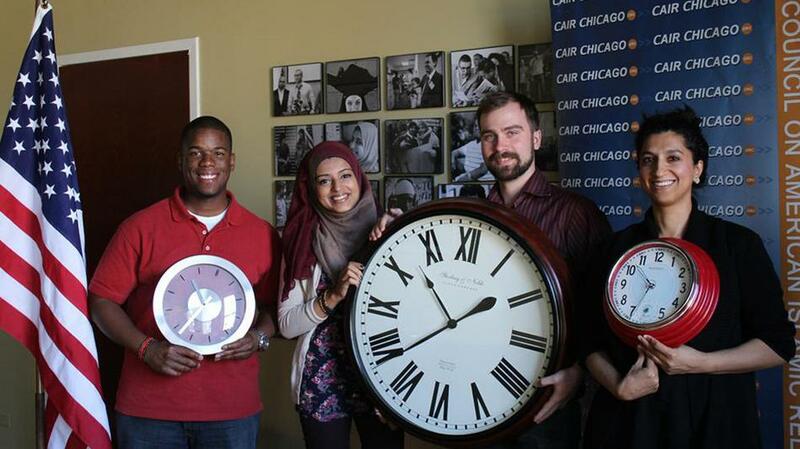 He didn't build his own clock so much as put existing parts of a clock together into a box. So what factually correct answer would they have accepted? The school definitely failed due diligence because they didn't talk to the engineering teacher (didn't know they had an engineering class in high school, must mean science teacher). I think the kid got mistreated, but I really don't care for the race baiting in this case. This has nothing to do with the fact that he's Muslim or of Muslim origin. There were plenty of examples of white grade school children who were suspended for merely chewing a cookie into the shape of a gun. Then there's the whole anti-microaggression craze happening in US colleges. I'm glad I am not the only person that noticed that the clock was about as home made as a dinner transfered from a takeout container to a plate. There will be a day when teachers will say : "Remember kids, bring a note from NSA for tomorrow's assignment"